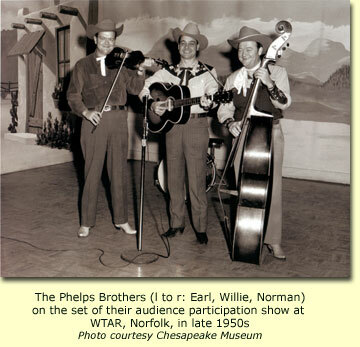 Brothers Norman, Earl and Willie teamed to make history in the annals of Country and Western Music. 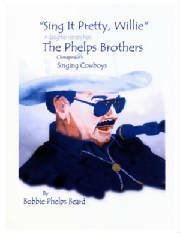 We honor the Phelps Brothers for their contribution to Western Music. He died with a guitar in his hands courtesy of old friend and bandmember Woody Nordan, who was bedside the evening of March 1, 2004 when Willie Phelps passed away. Woody sang him the song Willie had written so many years before and fulfilled the prophesy by placing the guitar in his hands. At his funeral his old time friend, T.T.Dyer, who use to sing with Norman Phelps & the Virginia Rounders, sang "Good-by Buckaroo," an old Gene Autry song. The family has been overwhelmed at the outpouring of love and condolences that we have received from all over the world and thank you all very much. He loved you all and we will all miss him. With Willie's death an era ends but he'll forever live in our hearts, on recordings & film. We know we'll meet again in that Goldmine in the Sky.